The battle for the top graphics crown continues between AMD and Nvidia with the recent announcement of the GTX 680M. The previous red Radeon HD 7970M king will soon be passing the torch to the green Nvidia team if these quick preview benchmarks are any indication. 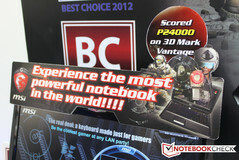 Notebookcheck is on-site at Computex 2012 and were first in line to benchmark the new 28-nm GeForce GTX 680M. 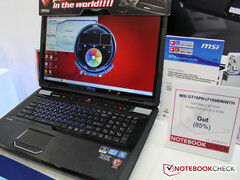 The provided 17.3-inch MSI GT70 test machine was a powerful beast as expected. 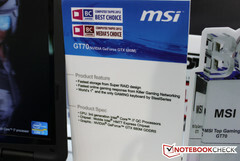 While we already have a separate MSI GT70 model in our labs with a Core i7-3610QM and GTX 670M graphics, the one on display at Computex easily takes the cake as top performer. 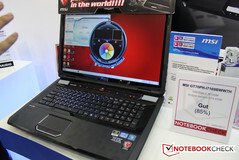 The GT70 here at Computex 2012 was sporting a 2.9 GHz Core i7-3920XM CPU and GTX 680M graphics with GDDR5 RAM. Interestingly, the MSI model allows for overclock of up to 4 or 5 percent with Nvidia's new Dynamic Overclock. While MSI claimed a 3DMark Vantage score of 24000 points with PhysX and overclocking active, our own test returned only 21952 points with PhysX and overclocking disabled. Impressive nonetheless. According to MSI, this particular model won't see a release likely until at least two months later or sometime August-September. As usual, expect a full review from Notebookcheck as the launch nears. 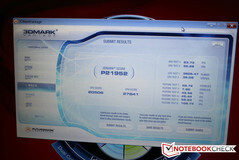 Referencing our own database of GPUs, the Radeon HD 7970M returns about 21674 (total) and 21661 (GPU) in 3DMark Vantage. In other words, the GTX 680M may be much closer to the Radeon HD 7970M in performance depending on the task at hand. 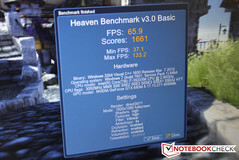 In Heaven Benchmark v3.0 Basic, the GTX 680M in the MSI notebook was able to score 1661 points with a maximum of 65.9 FPS.